Forensic artist Fiona Glass is the best in the business — which is precisely why she’s quitting. Her skill at mining victims’ memories to re-create the faces of sadistic criminals has left her haunted and wary, and only Jack Bowman’s dogged persistence convinces her to help him. The rugged police chief is hunting a serial killer who’s targeting teenage girls. 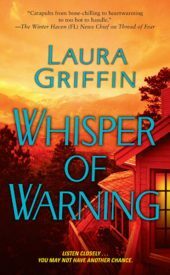 But what seems like a simple assignment is fraught with complications, including a searing attraction to Jack that’s tempting Fiona to let her guard down in potentially dangerous ways. Jack never intended for Fiona to become so deeply involved in the case — or in his life. But every instinct tells him she’s his best hope for finding a psychopath who’s lurking in plain sight, growing more ruthless with each passing day. And now that Fiona is right in the killer’s crosshairs, the only way to keep her safe is to unravel a small town’s darkest secrets, one terrifying thread at a time…. 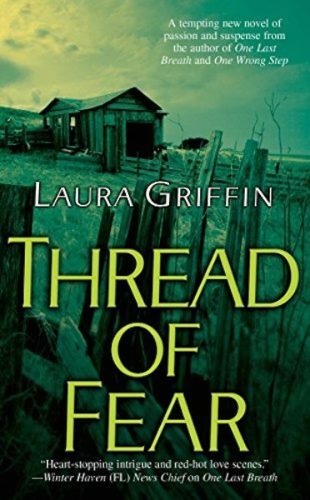 "Readers who love a great mystery with plenty of suspense will want to pick up a copy of Laura Griffin’s novel THREAD OF FEAR. This is the kind of book that keeps you on the edge of your seat, turning the pages." 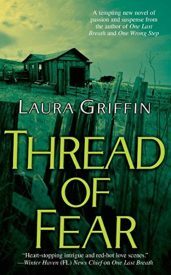 "THREAD OF FEAR is a tantalizing suspense-filled thriller. Enjoy, but lock your doors."